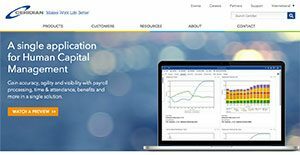 Dayforce HCM is a cloud-based platform for workforce management, payroll and tax, analytics, benefits, document management, talent management, and HR management. It is a single app that provides companies complete access to real-time data across all aspects of human capital management (HCM). Dayforce HCM offers no user interfaces and one user experience. Organizations can use the app to find and hire the right talent, manage compliance, schedule staff with work-life balance, maintain HR records, process pay, and manage benefits enrollment. Dayforce HCM’s single employee record consolidates all HCM processes. Ceridian’s Dayforce HCM offers complete HCM features in a unified suite. You can use the app to manage core human resources, on-boarding, benefits administration, payroll and more. Dayforce HCM is web-based and flexible, and compatible with all popular browsers. Dayforce HCM helps employees check work-related transactions and information. Managers can get access to real-time reports that have embedded analytics. Executives can use the app to get important data across applications and departments. Dayforce HCM uses only one record for each employee, which minimizes errors and redundancy. Ceridian’s experts help with garnishments, tax filings, and other payroll-related activities. The vendor also offers multi-currency and multi-language support as well as additional help for international personnel tracking. You can seamlessly integrate Dayforce HCM with other platforms to make use of the few HR applications that are not offered by this app such as video interviewing. Enterprises have unique wants and requirements and no software platform can be ideal in such a situation. It is useless to try to find an ideal off-the-shelf software app that meets all your business needs. The smart thing to do would be to adapt the system for your special wants, staff member skill levels, budget, and other elements. For these reasons, do not hurry and subscribe to well-publicized trendy applications. Though these may be widely used, they may not be the perfect fit for your unique wants. Do your research, check out each short-listed application in detail, read a few Dayforce HCM reviews, speak to the vendor for explanations, and finally select the application that provides what you need. How Much Does Dayforce HCM Cost? We realize that when you make a decision to buy HR Software it’s important not only to see how experts evaluate it in their reviews, but also to find out if the real people and companies that buy it are actually satisfied with the product. That’s why we’ve created our behavior-based Customer Satisfaction Algorithm™ that gathers customer reviews, comments and Dayforce HCM reviews across a wide range of social media sites. The data is then presented in an easy to digest form showing how many people had positive and negative experience with Dayforce HCM. With that information at hand you should be equipped to make an informed buying decision that you won’t regret. This saved me so many hours every week! An awesome application for HR and payroll. Ceridian has high standars and great quality. Comprehensive, all-in-one, cloud-based... everything you need in one system! What are Dayforce HCM pricing details? What integrations are available for Dayforce HCM? Pros: Navigating around the system has been nothing but excellent. Available views for viewing your day at one glance is considered a big help since they let you decide between visualizing and perceptualizing. Cons: With this build, I used it with Aeropostale and it led to things being buggy. It's obvious that something is working and changing. Other than that, I had a good time working with the system without any major issues or whatsoever. Pros: Everything including employee data, schedule, attendance, and time management are all in this application! Any system capable of integrating data pieces while having tracking capability is a huge saver for me in terms of productivity. Cons: Looking into a single week can be annoying especially if you happen to be within a scheduler roll or seeking to create behavior patterns relating to punch activity. There's way too much data that you'll need to keep in mind which acitivity it is you're aiming to accomplish. We used a lot of paper which would get lost on desks a lot of times. With Ceridian Dayforce we now have everything electronic and no lost papers. We switched to DayforceHCM Dec of 2016 and haven't looked back! Everything is in one platform, self-service, paperless, could based, intuitive, and easy to navigate. Dayforce HCM streamlined our processes! Ease of use, access to data, robust reporting features. The all-in-one platform. Single sign-on, integration of reporting, ease of creating roles/security levels. If you need more information about Dayforce HCM or you simply have a question let us know what you need and we’ll forward your request directly to the vendor.